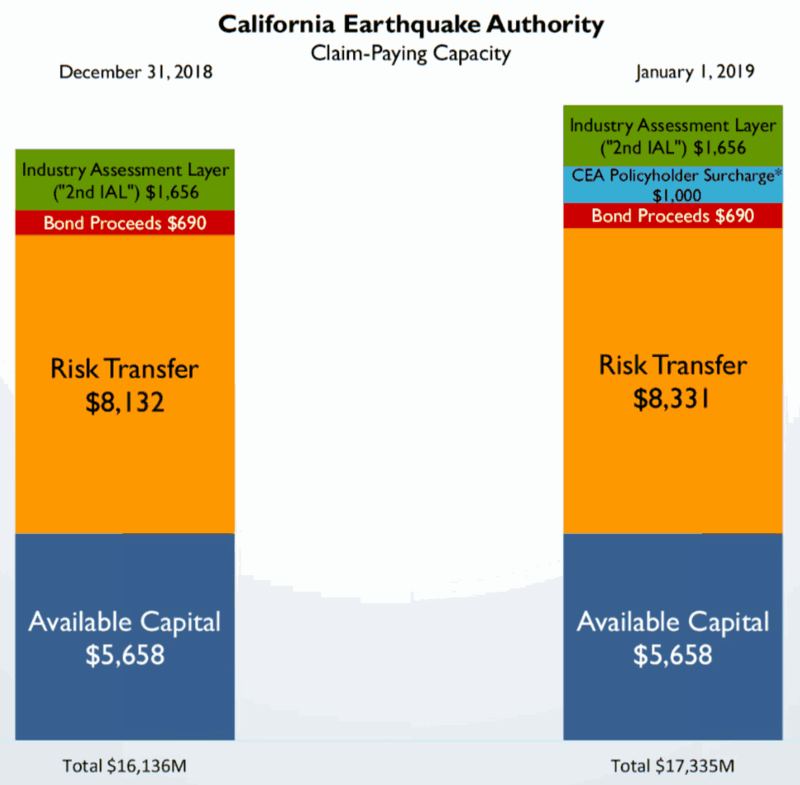 The California Earthquake Authority (CEA) increased its reinsurance protection again at the January renewals, lifting the program to its largest ever at $8.331 billion. The CEA’s reinsurance program grew to $8.132 billion by the end of 2018, but then a number of maturing layers and renewed arrangements at the 1/1 2019 renewals saw the earthquake insurers tower growing by almost $200 million to a new record high. The CEA’s reinsurance renewal needs were significant at January 1st 2019, as over $2.28 billion of its in-force earthquake reinsurance protection expired at the end of 2018. As a result and given the program expanded by roughly $200 million, the CEA must have renewed and purchased a total of around $2.48 billion of reinsurance limit at January 1st 2019. The CEA remains one of the largest reinsurance buyers, acquiring a mix of traditional and collateralized limits, as well as it’s still in-force $2.075 billion of California earthquake catastrophe bonds. Another just over $1.132 billion of the CEA’s reinsurance program expires at March 31st this year, suggesting the insurer will be back in the market to renew some more of its program in time for April 1st. So far in 2019, no new catastrophe bonds have come to market from the CEA, but half a billion of its cat bond limit matures in November, so there’s a good chance we will see the Authority back in the market around that time (if not before). The CEA has increased its overall claims paying capacity significantly around the renewal, adding an additional billion of capacity through a policy-holder surcharge as well. Hence, along with the increased $8.331 billion of reinsurance and risk transfer, the total claims paying capacity of the CEA now sits at $17.335 billion. The CEA’s reinsurance program and needs continue to expand, as the insurer continues to increase quake insurance penetration in California. The CEA’s reinsurance program provided only $2.16 billion of protection way back in 1997, growing to just $4.6 billion in size almost two decades later by the end of 2015, then growing 20% to $5.4 billion by the end of 2016, followed by another 15% growth to reach $6.3 billion at January 1st 2017, then increasing in size by 27% in just one year, to reach $8.02 billion after January 1st 2018. It then jumped to $8.132 billion by the end of 2018. But more reinsurance limit is bound to be required, as the CEA recently said that even based on a modest rate of projected growth, it could need to increase its claim-paying capacity from $17 billion to as much as $48 billion of financing and risk transfer. That suggests growing participation from the capital markets in the program, as the CEA will need access to all the efficient risk capital it can find. 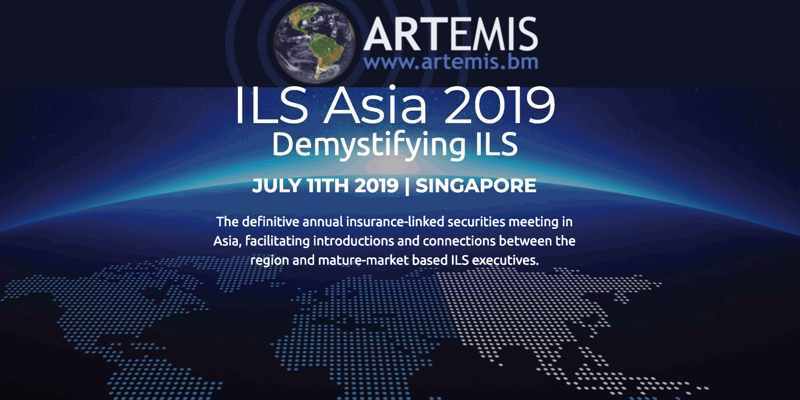 We’re returning to Singapore for our fourth annual ILS market conference for the Asia region. 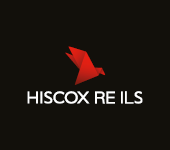 Please register today to secure the best prices. Early bird tickets are on sale now.